We met close to their homes at Shish Garden in Woodhaven. It’s a Middle Eastern fare restaurant, and though I’ve had a few ME meals since I moved to Michigan (ethnic food is abundant here! ), I don’t necessarily feel comfortable choosing my meal. Hommous aside! 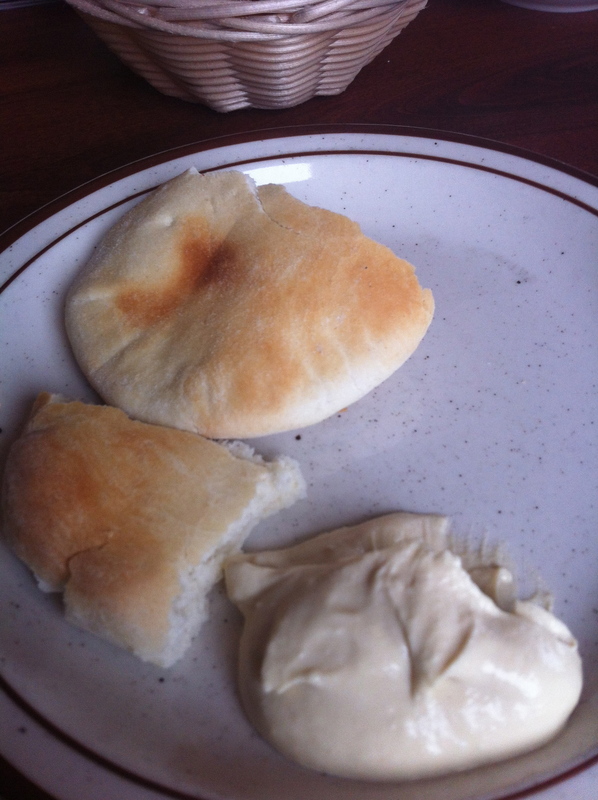 Hommous and fresh baked pitas. I asked Mariesa, our waitress, to choose my dinner for me. She gave me a slightly odd look, but then said okay and went off to place our orders. She came back a few minutes later to see if I had a preference for chicken, beef, or lamb – to which I replied “nope!”. So, off she went again. My friends all ordered perfectly portioned sandwiches and they knew I was getting a full entrée when Mariesa brought me a Fattoosh salad to start the evening. 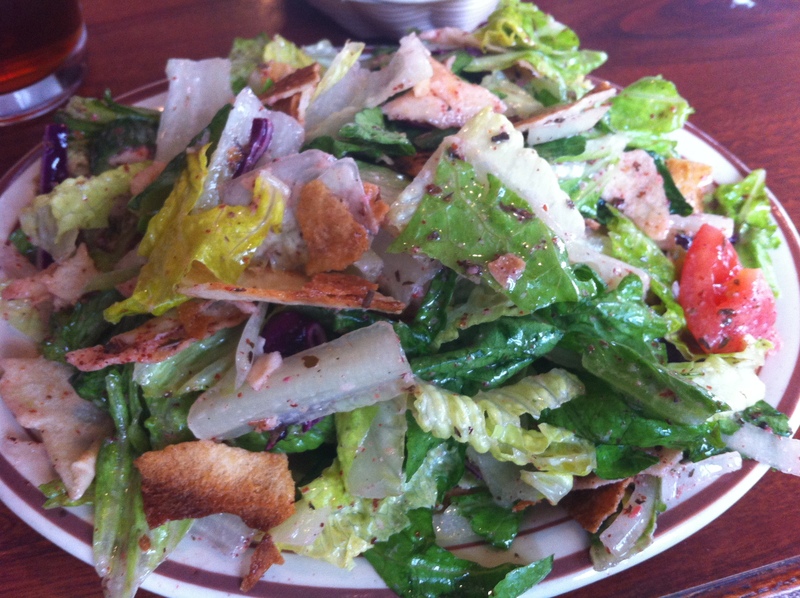 It was a really delicious salad – lettuce, tomatoes, cucumbers, tossed in herb dressing and covered with toasted pita chips. It was also big enough to be my entire meal! Indeed, I needed a box to take most of it home. After the salad, when my friends were served their small sandwiches, I was served a heaping plate of seasoned chicken, grilled vegetables, and rice. 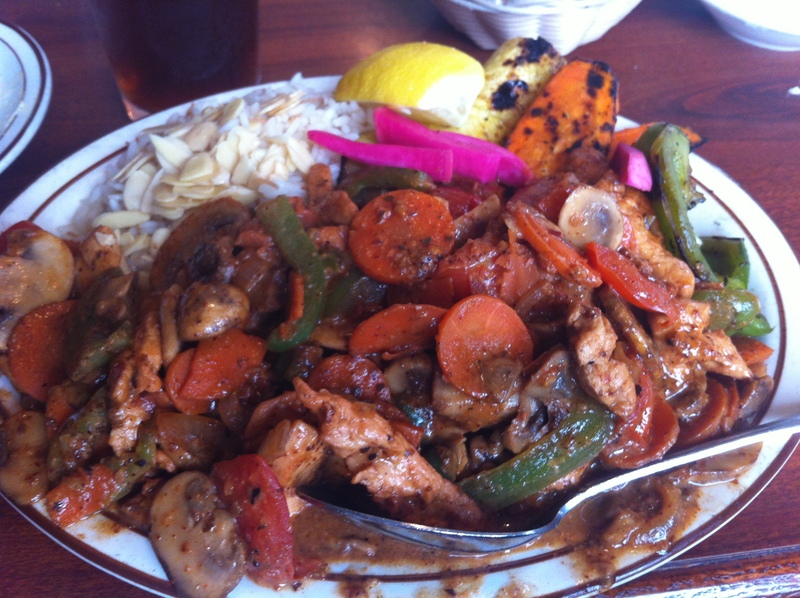 I was told it was the Classic Ghallaba plate, with chicken and rice. 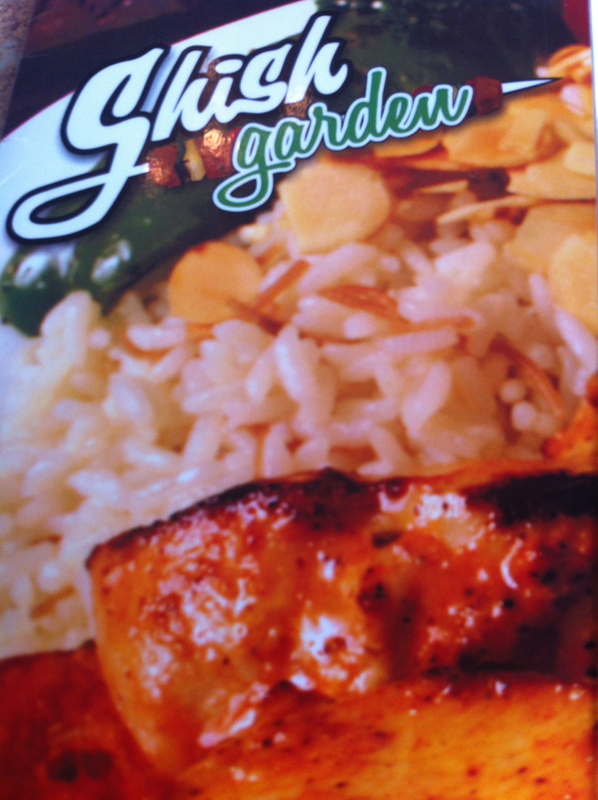 Ghallaba with chicken and rice. The flavors were tremendous! It was a wonderful choice by Mariesa. I also needed a big box to take leftovers home. I’m guessing I have at least three more meals to go before I come close to finishing this one! But, it’s so tasty, I don’t think I’ll have trouble eating leftovers (typically not my favorite thing). My friends were so supportive as we talked about this blog, and they all read (and LOVED!!) Jerod’s story while at the table. They also admitted to being indecisive at times too, and I think they might be inspired to give their servers a chance to surprise them sometime in the future – even if it’s only making a choice amongst two or three dishes. Baby steps! No waiting another six months or so for a lovely girls’ night out! :-). I hope to guest blog in the near future! Thank you for this!!!!!!! !